‘For the sake of our health, our children and grandchildren, and even our economic well-being, we must make protecting the planet our top priority’, once said the award-winning environmentalist David Suzuki. There are quite a few people on this planet earth who have realized that they owe to their planet as well. Global warming has deteriorated the earth’s condition. The earth is sinking deep down in the pit and the inmates are busy in their own lives. Suzuki has smartly put it as, ‘We’re in a giant car heading towards a brick wall and everyone’s arguing over where they’re going to sit.’ But Suzuki is not oblivion as the rest of the people are. Suzuki understands the importance of securing the planet. Suzuki is working hard enough to create the awareness among the masses to preserve the earth. David Suzuki was born on March 24, 1936 in Vancouver, British Columbia. Suzuki’s ancestors had migrated to Canada. During the World War II, Suzuki’s family had a rough patch and they had to move to Rockies and then to London. Suzuki attended London Central Secondary School and also became Students’ Council President during his last year over there. Suzuki completed his graduation in B.A. in Biology and his Ph.D. in Zoology from University of Chicago in 1961. During his B.A. Suzuki developed an interest in the genetics study. Therefore, after completing his Ph.D. Suzuki became a professor in the genetics department at the University of British Columbia for almost forty years from 1963 to 2001. In 1970, Suzuki appeared on television with his show for children, Suzuki on Science. Later, he started a radio program, Quirks and Quarks. He also targeted adult audience through his weekly program, Science Magazine. He has also hosted, since 1979, a CBC television series, The Nature of Things. In this program, Suzuki works on in building an interest of the people in the natural world. He identifies the threats to human well-being and wildlife habitat. Suzuki also explains about the alternatives which could achieve a more sustainable society. Suzuki is also a strong supporter of renewable energy sources and the soft energy path. 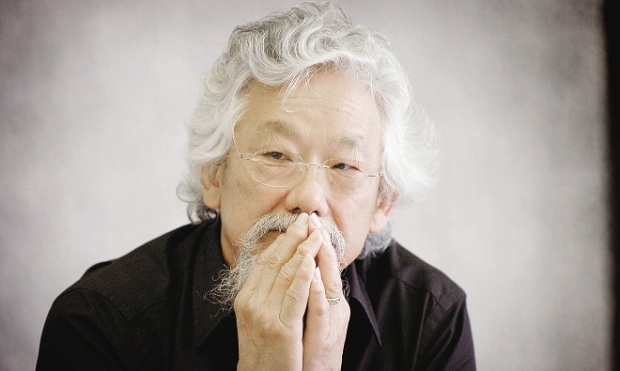 Suzuki has also been famous as an activist for ‘climate change’. He also urged the students of McGill University to speak out against the politicians who couldn’t act on the climate change. Suzuki tried on explaining the gravity of the problem caused by the climate change. Suzuki stressed that human activities are contributing at large in the climate change. Suzuki also opposes the laws of immigration. He believes that Canada already has large population and the immigration should be denounced. Suzuki has received negative criticism on his opinions against the immigration. David Suzuki has also written 52 books, 19 of which are children books. He had been awarded honorary degree by over a dozen of universities. He currently lives with his second wife, Tara Cullis, in Vancouver.